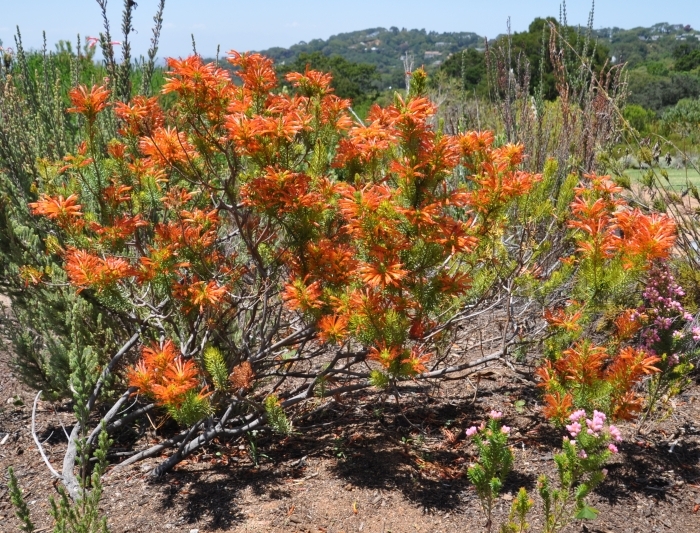 A sturdy fynbos shrub with outstanding bright orange flowers at the hottest, driest time of the year. Erica grandiflora subsp. grandiflora is a robust, upright shrub 0.8–1.5m tall, with ascending branches. Leaves are linear, 15–20 mm long, erect to incurved, upward-pointing, ending in a point and hairless. The corolla is bright yellowish orange, orange, orange-red to quite dark red, tubular, 10–34 mm long, hairless, and can be sticky or dry. The corolla lobes are acute, and flare out slightly as the flowers open. The style is exserted, and the anthers can be far exserted to not exserted. The flowers are clustered at the tips of the branches, in mid to late summer (January to March). Although it has lost some habitat on the lower slopes and flats in parts of its range, it is widespread and common, and many populations occur in protected areas, thus it is not in danger of extinction and is categorized as Least Concern (LC). Erica grandiflora subsp. grandiflora occurs on open, dry, coastal hillslopes, low hills and rocky inland mountains, from Franschhoek just outside Cape Town, inland to Ceres and the Witteberg at Matjiesfontein and southeast to the Langeberg near Ashton, at 80–1 500 m altitude. It is absent from the Cape Peninsula. It grows in soils derived from sandstone, in fynbos. The genus Erica gets its name from ereiko, meaning ‘to break’, either because of the ability of the plant to break up bladder stones or more probably because the stems are brittle and break easily. The species name grandiflora means ‘large flowered’. This species was named by Linnaeus the Younger in 1782. 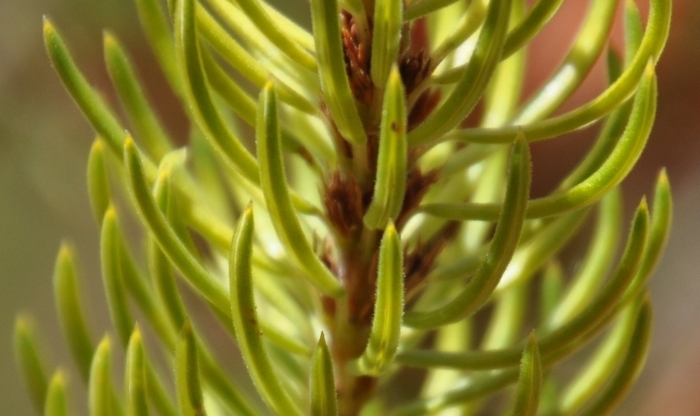 It was moved into the Erica abietina complex in 2002 and renamed Erica abietina subsp. aurantiaca. The name abietina means ‘like the genus Abies’ referring to the fir-tree-like leaves, and aurantiaca means ‘golden’ or ‘orange-coloured’, referring to the colour of the flowers. 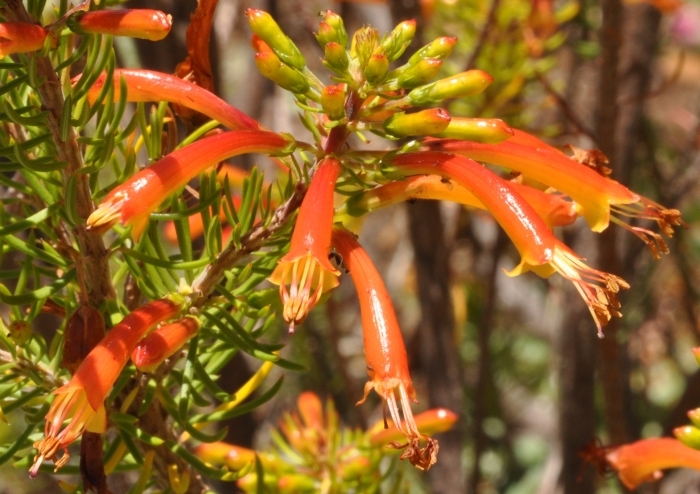 Recent molecular studies show that this species is not as closely related to the Erica abietina group of the Cape Peninsula as previously thought, but shares more affinity with the Erica viscaria group of the mainland and should be treated as a separate species. Its original name has therefore been reinstated. Another subspecies formerly grouped in the abietina complex, Erica abietina subsp. 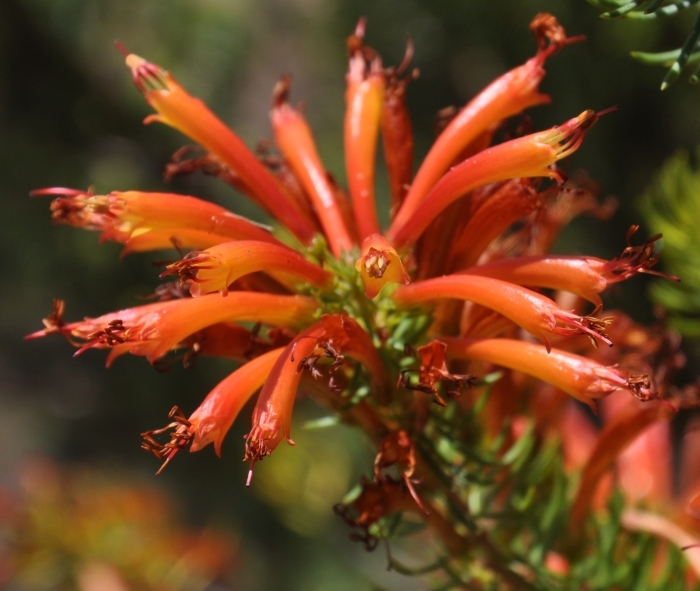 perfoliosa, which occurs on granitic slopes in the Jonkershoek Valley near Stellenbosch and has pure yellow flowers and densely hairy, non-sticky corolla tubes and leaves, 20–30 mm long but can be as long as 42 mm, is now classified Erica grandiflora subsp. perfoliosa. The name perfoliosa meaning ‘very leafy’. The flowers are visited by nectar-feeding birds, such as Sunbirds, which insert their long, curved beaks into the tubular flowers to reach the nectar at the base of the flower tube, and in so doing, touch the anthers and stigma, and transfer pollen from one flower to another while feeding. Erica grandiflora subsp. grandiflora does not have a persistent rootstock and is killed by fire. 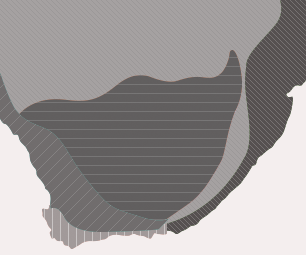 The population regenerates from seeds. Erica grandiflora subsp. grandiflora is not used in traditional medicine, nor is it a well-known garden plant or pot plant, however, its showy summer flowers and robust habit, make it a welcome addition to the summer garden. Grow Erica grandiflora subsp. grandiflora in an open, sunny position, in well-drained, sandy, acidic soil. Feed with well-rotted compost applied as a mulch once or twice a year. Dilute or low doses of slow-release fertilizer can also be used. Pinching the tips on young plants results in a more branched, compact and more floriferous plant. It is well suited to sunny rockeries, terraces, embankments and fynbos gardens in the winter-rainfall region. It is also suitable for containers, and makes a handsome pot subject. Propagate by seeds or cuttings. Sow fresh seed in late summer to autumn (March, April or May). Use a sandy, acidic, sterile medium. Because the seeds are very small, cover lightly or mix the seeds with some sand and cover the surface of the tray. Water with a fine rose and keep warm and moist. Germination takes a month or two, and seedlings are delicate. Transplant them when they are at least 10 mm high. Take semi-hardwood top or heel cuttings in late summer to autumn, or in spring. Treat with rooting hormone and place in well-drained, well-aerated, sterile rooting medium in a mist unit with bottom heating of ±24°C. Pot the rooted cuttings in a well-drained, acidic soil medium and harden off in light shade for a month or two. Jackson, W.P.U. 1990. Origins and meanings of names of South African plant genera . University of Cape Town.|Jeffrey, C. 1967. Cucurbitaceae. Flora of tropical east Africa . Oliver, E.G.H. & Oliver, I.M. 2002. 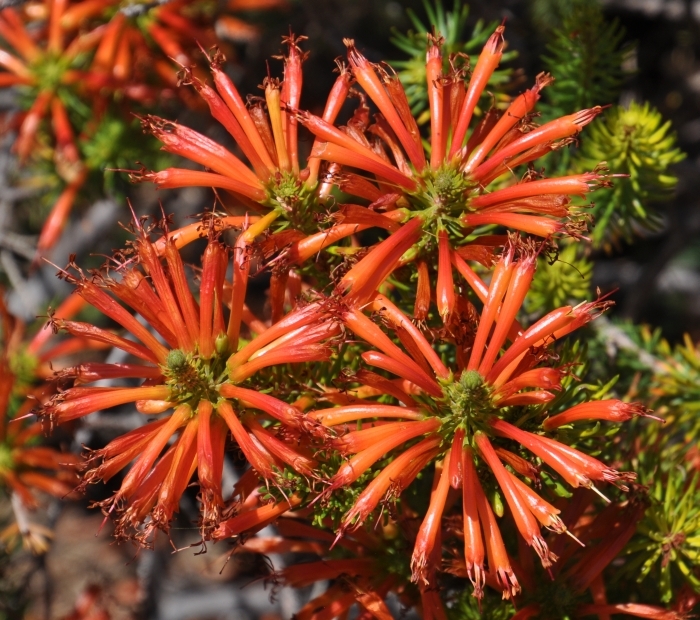 The genus Erica (Ericaceae) in southern Africa: taxonomic notes 1. Bothalia. 32 (1). doi:10.4102/abc.v32i1.461. Pirie, M.D. et al. 2017. Underestimated regional species diversity in the Cape Floristic Region revealed by phylogenetic analysis of the Erica abietina/E. viscaria clade (Ericaceae). Botanical Journal of the Linnean Society. 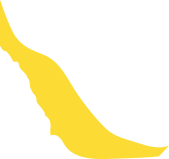 184 (2): 185–203.